Hello friends! Recently, I have really been loving prismatic eyeshadow – and that love is starting to bleed over into lip products. I mean, who doesn’t love shiny, color-shifting things? I was browsing the Maybelline section of Target, and a little tube of lip gloss caught my eye. At first, this lip gloss appeared white. But as I picked it up to examine it, I noticed it has beautiful purple and blue reflects! It was only $4.99, so I snatched it up. I found that the prismatic topcoat looked best over my blue, green, and purple lipsticks. The consistency is quite goopy, and it can be easy to use too much if you apply it directly to the lips. My favorite method to apply is just to squeeze a little onto my finger, and then dab it over my lipstick. I also found that it works best over a dried-down liquid lipstick. When I applied it over a creamy lipstick, it made quite a mess and smeared everywhere. Below, I am wearing one coat of Wet ‘n Wild’s MegaLast Metallic Liquid Catsuit in the shade Siren’s Jewel. And here is the same shade, but topped with one layer of the Shine Shot Prismatic Lip Top Coat. 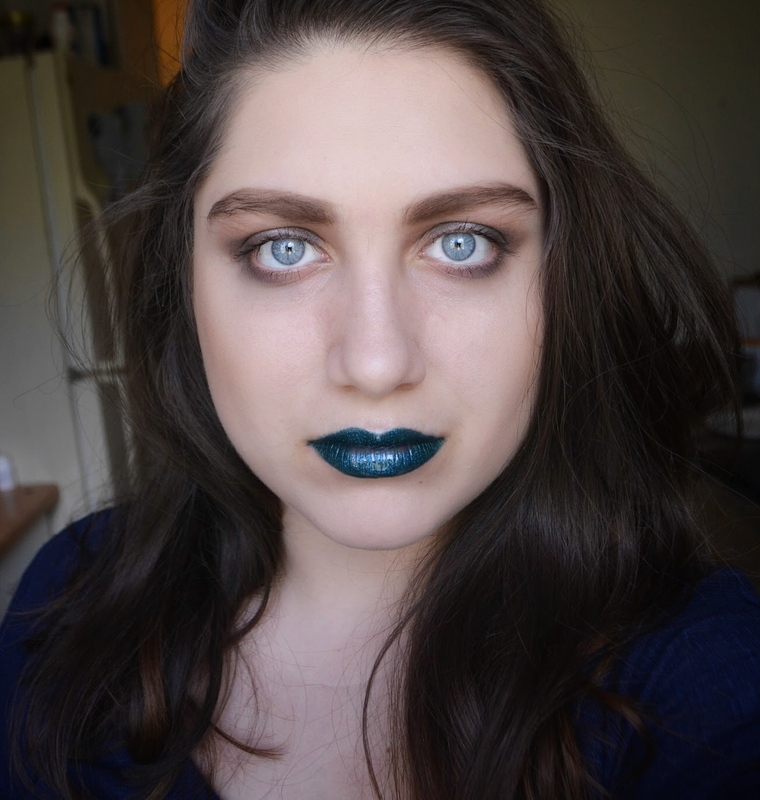 As you can see, the blue reflects complement the green lipstick very well! It created such a shimmery, glossy, gorgeous look. Even though the prismatic top coat does have a glossy finish, it is not as glossy as Maybelline’s Glassy Gloss top coat . And I just used the word “gloss” three times in one sentence; I’m sure that breaks all sorts of writing rules. 😉 Anyways, I incorporated the prismatic top coat into today’s makeup look! I really think this transformed my lipstick, and gave it such a beautiful mermaidy sheen. I am one the fence with how I feel about this product though. One the one hand, it works beautifully with my cool-toned liquid lipsticks. One the other hand, it is pretty messy and does not work well with warmer-toned lipsticks. And I have way more warm toned than cool toned lipsticks! However, I feel like that’s on me, rather than the product’s fault. I will give this a 4/5. It would be a full 5 if I could apply straight from the tube, rather than with my finger. I really hope you found this review useful! You can purchase a tube of this gloss from Target for only $4.99. Let me know if you have ever tried a prismatic top coat before! oh my gosh that top coat is gorgeous!! Also, LOVE you with that lipstick shade! This is SO PRETTY! Thanks for sharing 🙂 I’ll definitely have to buy this one! waoo these shades are amazing & beautifull i like it thanks for sharing..